Hello all, and thanks for welcoming me so warmly. I’m new to this role of Executive Director, but this is my third year helping our wonderful community work together. During that time, I’ve worked with a lot of teams and have been able to see what seems to be working well for most of us. Working with multiple teams across the project has also given me the chance to identify some things we all struggle with. I’ve received feedback from contributors, too, about where they feel more support is needed. Here are some of the places where I see we (contributors of all types) can have the most impact over the course of the year. We can start solving some of these things right away (please join me in using this P2 for talking about project-wide work for starters). Others will take some exploration and planning. After people have had a chance to weigh in, I’ll follow up with some next steps! Will post the Docs / Polyglots project that we’re likely to start for localising HelpHub when we have more details here! I’m very interested in point 2 in the opportunities for help: “Aligning our work better to project goals/values”. WordPress’ development has lacked, for better and worse, project-level documentation that helps folks stay in alignment on overall project goals. I’d love to see us learn more from professional product managers in terms of how roadmaps and product plans can be documented and standardised across the project, to keep everyone on the same page. Having this resource will help folks not only align with, but also support and expand on the project’s high level vision. I agree! From a larger picture standpoint, I also think that this lets the project as a whole be more respectful of volunteer time. A lot of the feedback I’ve heard over the past year was around having worked hard on something only to learn it isn’t in the overall vision right now. I think we can all do our part toward fixing that. Presumably under the “Coordinating on collaborative work between teams” topic, there are two issues I’ve run into the most over the last couple of years. In Core it’s been difficult to find other product/pm folks to help with the weekly rhythms (think agendas, running devchat, posting summaries, etc. ), though several engineering-type folks have pitched in wonderfully it seems that their time would be better spent on patches, testing, and the like. Also, in Tide it’s been tough finding folks with specific engineering skillsets (think Golang and Google Cloud Platform) to help work through issues on our roadmap. Both of these areas of finding people who can help has been a difficult problem to solve and one I’m certain other Teams have had similar problems with. Very specific observations on missing skill sets. Thank you. I am assuming “pm” means either project management or product management, both professions/calling that take a lot of emotional energy. Do you think that the lack of p-managers on various project/team might have something todo with the emotional resources drained from the day job? It’s hard to manage a very diverse and heterogeneous group in an open-source, collaborative, and consensus driven setting. You seem to have a lot of energy and poise in doing what you do, others need to bring in their whole person to be successful and planning for others. Collecting input, listening and communicate clearly, yet emphatically is really hard. It’s a hard decision to take that role and responsibility. …. their time would be better spent on patches, testing, and the like. I know, you didn’t mean it as a ‘value’ statement, more as a resource allocation remark. Great thing to call attention to, Birgit! I think that, not only is project/product management a high-cost emotional task, I think at this point it’s also a high-cost mental task. Asking volunteers to track all the work through all the project is a Big Ask considering that even I (working ~50 hours a week on this) have trouble keeping it all in mind sometimes. @bph we have very talented software engineers who are able to contribute their time and efforts in providing patches on bugs and enhancements (among other roles across other Teams here on .ORG), there’s no reason we cannot solicit for experienced project and product managers to help provide these Teams with the ability for everyone to focus on what they do best. Asking non-project and non-product managers to cover those roles is sub-optimal, thus my call out that finding folks to help fill those gaps as a need I see across .ORG. Again, I’m certain there are folks filling those roles across various Teams, but I’ve seen it as an issue on areas that I’ve contributed to or otherwise observed (yes, I merely _lurk_ in some channels / teams). Thank you for this observation, Jeff. I think you’re right that this falls into better coordination: matching people with skills to teams that need those skills. places where we are at risk of falling behind or losing our momentum. Does that sound like it would be worthwhile? @chanthaboune yes, it seems that surfacing those more broadly could definitely help items that need attention actually receive it. If I’m understanding your idea correctly, it sounds similar to the Scrum of Scrums concept that I’ve seen used to positive effect on multiple, large, related groups. How do I join and help you out with some of these things? Thanks for initiating the discussion! I’m looking forward to reading through everyone’s comments and seeing what proactive suggestions are identified. I’ve been around the WordPress community since 2007 or so. My first substantial contributor experience was maintaining WP-CLI for a few years after scribu stepped down. For the 3.6 cycle, I was named a focus lead for editorial workflow and that ultimately failed. I was later involved with landing the REST API in core (4.4 and 4.7), and most recently was the REST API release lead for 5.0. At times, I’ve been paid or sponsored directly for contributing. At other times, I’ve volunteered on my own time. Ultimately, my desire for organizational improvements is out of my own self interest. WordPress has been a significant part of my professional career for over a decade, and I’d very much like to continue my involvement. Overall, I enjoyed the experience. We (everyone contributing to the REST API component) were able to make a substantial contribution in a reasonably manageable time frame. It was helpful to have a specific focus/scope of responsibility. It was even more helpful to have a contributor pool that accomplished a lot in total and was able to rotate in and out based on availability. My glaring error was that our dev notes weren’t published until the last minute. I should’ve known but I didn’t/forgot/had no documentation to reference. It wasn’t clear what my ongoing responsibility or commitment was. Open-ended obligations make for a poor volunteer contributor experience and eventually burnout. Generally, it’s not clear what the process is to onboard or off board committers, or their what their ongoing responsibility is. In fact, I don’t even know who is an active committer anymore. I’d be happy to be a committer again in the future, provided it’s clear what my ongoing commitment, responsibilities, and expectations are. I can’t say this was clearly communicated to me for the release lead role but it was more obvious what needed to be done and that there was an urgent need. Define goals and deliverables for each project deliverable. Once these are defined, it’s much easier to estimate the level of effort and resources required. Distinguish between full-time sponsored, part-time sponsored, and completely volunteer labor. Each of these three do not work at the same pace. It’ll be much easier to estimate a team’s velocity if you know what type of labor you have to work with. Similarly, allow contributors to self-identify how much time they have available and what their other ongoing open source commitments are. And, most importantly, ensure leadership over-communicates the direction we’re headed and why we’re headed there (bi-weekly?). When decision points are presented, distinguish between consent and consensus. As a contributor, I may not agree but it’s much easier to disagree and commit when I understand the rationale and type of input requested from me. Hope this helps! Happy to clarify on any points as useful. Most importantly, ensure leadership over-communicates the direction we’re headed and why we’re headed there (bi-weekly?). When decision points are presented, distinguish between consent and consensus. As a contributor, I may not agree but it’s much easier to disagree and commit when I understand the rationale and type of input requested from me. FWIW, there is some light documentation in the handbook that covers the mechanics of it, but I’d like to see it expanded with a more explicit description of expectations, etc. As a contributor, I may not agree but it’s much easier to disagree and commit when I understand the rationale and type of input requested from me. Daniel! This is super helpful and really thoughtful. Thank you for the effort you’ve put in (both to the project and to this specific question). I don’t have anything that needs clarification in your comment, but I do see a number of things that are actionable, so I’ll take it. You’re welcome 🙂 Next time I promise to not post from my bike trainer and take an extra moment to proofread. Discussing, contributing to, and having input on project goals and values. Having input on priorities, short- and long-term. Understanding policy around participation in wider discussions involving web platform and the internet. adopting de-escalation and “calling in” as conflict resolution models. Hey there, Morten! I think I understand all of what you’ve outlined here. Just for my own confirmation, these are in the “Challenges” section, right? Thanks for this Make post and the opportunity to discuss important points. From an accessibility perspective, the most urgent thing is making accessibility part of the design (design in a broader sense) and development process since the beginning. It has to do with collaboration between teams but probably WordPress would need to explore completely new ways for teams to work together. Some areas of expertise, starting from product and software architects, designers, developers, and accessibility specialists, need to work together to build a better product. Just wanted to note that the Accessibility team has started brainstorming around this topic during the last couple weekly meetings and there’s great interest in discussing together concrete action plans. Can you tell me more about what you mean here? Thanks so much for this post, and for starting up discussion! I think you’ve pinpointed well many of the things that are going well, and things that would be great to work on together. Could you please clarify what you mean by this point, since I’m not entirely clear on it? This is one that I think is something of a background process as we sort and prioritize for our teams (both here in WP and elsewhere), but that maybe we should be more aware of. For example. Mike, let’s pretend that I just spent 100 hours writing a patch that changes the entire wp-admin color scheme to blue. As a contributor, I really poured a lot of effort into that (regardless of how fast someone else could have done it), so I advocate strongly for inclusion in the next release. I would hope that a seasoned contributor would help me know the reasons why that’s not the sort of contribution we need now. But either way, my un-seasoned view of open source is that all created things get added, no matter the circumstances of its creation. It is, at the heart, related to something that has been echoed in comments above around knowing when a discussion is seeking consensus or consent. The most urgent for the Theme Review Team is that we do not have a clear purpose and goal that is documented. Who is the team for and who is the theme directory for -these are in constant conflict because we work and communicate with theme authors with agendas -not theme users. The team has not been able to prioritize between the two interests that are in conflict. Either we shorten the waiting time for theme authors, (because the waiting time to have a theme included is 4 months which is unacceptable) or we try to make sure that the themes that are added has a high quality and are secure. We have been unable to do both and we need direction. It is also unclear what the teams role is in desicion making and discussions regarding themes in general, including default themes. Note: I’m not a team rep.
Also it feels like the Theme Review Team is often overlooked in its contribution. We do some interesting open source stuff, but most of it (so I feel) goes unnoticed. Also, as poena mentioned, we don’t have a clear goal. We do theme reviews, open source contributions, we most often educate theme authors on how to write proper code. And yet we don’t have any sort of influence on themes directory, or any meta ticket regarding themes. Not to mention that there is a core-themes that are separated from theme review, and that also causes some misunderstanding at times (people reporting issues with twenty* themes). Hello! I’m a new contributor who brings experience in journalism, communications, JS, and just enough PHP to be dangerous to the table. 1) The leadership structure of the project is very unclear. I think that everyone could benefit from that information being more prominently published and available. 2) You get to know your team very well, but no so much other teams. I’ve met some great folks in Slack and am getting to know the two groups I’m involved in super well. But if I have an issue or a question that needs to be addressed to another group, then I would have to hang out in that team’s channel for a while to figure out who the right person is to get in touch with. Identifying “ambassadors” or points of contact for each group could be a quick and helpful way to address that. 3) The path to contribution for newcomers is different for each group. The project may benefit from a more general onboarding experience for new contributors and help direct newbie energy to teams/projects that could use some. 4) Every group has additional tools that they use for communication that can be hard to find. The different tools can also make it hard to keep track of all the pertinent conversations that are going because one thread is in Trello, another is in Github, and yet another is happening on Slack. I’ve been wading into the Design team and Accessibility teams to learn what the landscape currently looks like. I have a promising collaboration going with Luke Pettway that shows I am not the only unicorn out there interested in building bridges between teams. We definitely have some thoughts and ideas for how to enhance communication between these two groups in particular that could be applied more broadly, so if there is an effort to enhance cross-project communications, please count us in! Identifying “ambassadors” or points of contact for each group could be a quick and helpful way to address that. I love this ambassadors idea. My local chamber of commerce has ambassadors, and each contributes significantly to the health of the overall membership. Relating 1 & 2. The need for “ambassadors” (2) sounds to me like it arises from the lack of clear leadership (1). I personally don’t think teams need leaders and ambassadors, they just need a good, strong, stable and empowered leader. Daniel for a long time “owned” WP CLI, everyone knew that. He did a fabulous job of leading that component and part of that was being an ambassador for “all things WP CLI”. I look at the team reps page and I wonder why half those are named teams, and more importantly what the portfolio of responsibility for each of those teams actually is? Case and point, Mika is listed as the “plugins” team rep. A newcomer would likely assume that to include the Plugin API, but as far as I’m aware (reinsert point about the scope of responsibilities being unclear), she “just” leads the herculean job of managing plugin submission to the .org directory. I have the same confusion over Flow, Hosting, Themes, and more… none of these teams seem to have any clear mandate, nor any power to really move the project forward. What matters more to me is who the leader/ambassador is for the Media library, REST API, Users, Widgets? Heck who is the leader for the new Editor? Surely that has a dedicated module/component/product/team owner? I understand having teams that have skills sets that apply broadly across components, like the Accessibility team. They have a broad portfolio and help out across multiple components. However, Core alone is too broad and major components need their own leaders. Sorry, this was to be a short reply… felt it worthwhile to add a lot of context. What kind of support do you need to do your best work? As a contributor, knowing how to submit what I am working on for review and how the process works for deciding what updates will be included in each release are helpful things for me. Which of the above do you think is most urgent? Does this feel like it would be related to better cross-team coordination? No, I was thinking more along the lines of: if I submit a patch, do I need to ask for a code review? If my patch gets a code review, does that mean it will get added to the next release? How do people decide whether my patch gets added to the next release? Who decides? Do I need to ask about it directly if the patch doesn’t get attention? Who would I ask? Oh, gotcha! Clarity in the process, clarity in the decision tree. I apologise if I’m banging the same drum as I did pre 5.0 but I would love to see more support for communications for contributors across different time zones. At the moment most of the important meetings like the new contributors meeting or the core dev chats are at times that make it almost impossible for folks in non US timezone based countries to attend and/or properly contribute to. I know that the general concern is that adding new meetings may dilute the overall purpose of the existing meetings, but there may be other ways to solve this problem. Totally agree. Thank you! We need to get better at including Central and East Pacific Time zones in our meetings. Regionally diverse leadership recruitment might help with that. Good conversation to have. Create spaces that shine a light on the work no one sees. For every person, who expressed their frustration that their volunteer (sponsored or not) work is not acknowledged and valued, there are dozens more, equally hurt, dismissed and overlooked. Some of the best work is done by the quiet ones. Some of them like it that way, some of them won’t step up to do bigger things, when the little things they do are not seen. Don’t just listen to the squeaky wheels. Look behind the obvious. Some of them only talk when asked. There are angels among us. We learned from Daniel Pink’s “Drive” that money is not a motivator that sustains our best work, it’s purpose, challenge and mastery. Contributing to WordPress ticks all the right boxes. Some of us find silent pleasure in our contributions. Some of us fear to make mistakes in public or in private. Some of us need help, encouragement, permission and yes, praise to keep going, to get over our fears. Success is rooted in every person, every commit, ever meetup, every test failed every nook and cranny, in every corner of the WordPress Universe. Don’t just stand there. Celebrate. Dance. This is an important insight, Birgit, thank you. Do you have particular ideas about how we could accomplish this? 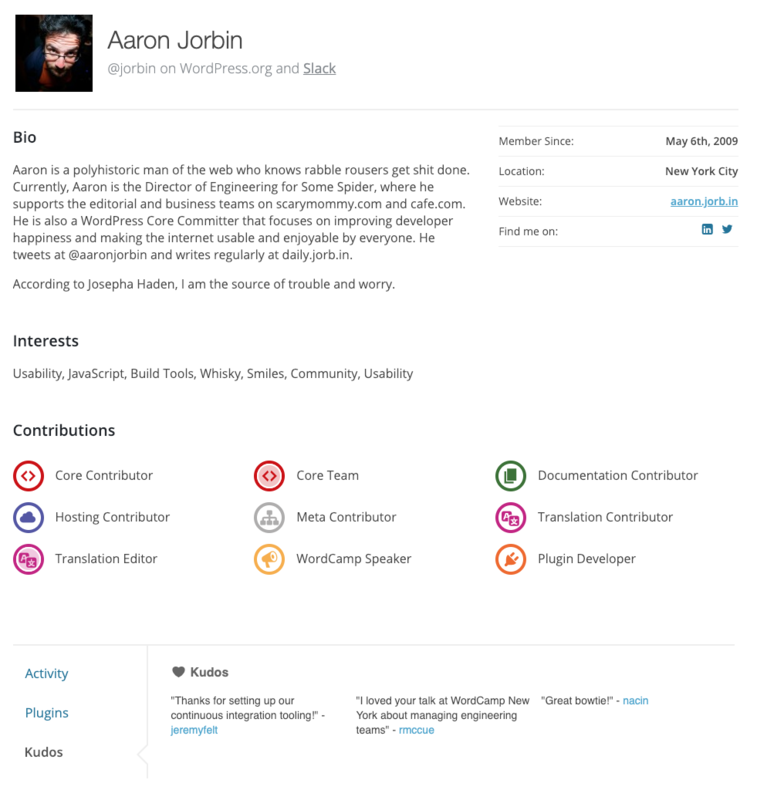 Inside Automattic we have a custom tool where anyone can give anyone else “kudos”, and those are then displayed on their internal profile (which is similar to profiles.wordpress.org). I wonder if we could build a similar system for profiles.w.org, so each profile would publicly display short messages of gratitude, congratulations, etc. 1. Something you accomplished that you are proud of. 2. Something a teammate did that you are grateful for. 3. Something someone outside your team did that you think is awesome. They are done in blog posts and comments, which is nice. They actually go in that order. I think the autonomy is pretty much way up there as a motivator in the WordPress community, as is Mastery. I am not so sure about Purpose yet. Also Dan didn’t really cover how to motivate people who are already quite motivated. Motivated people are usually quite busy and it takes something special (not profile badges) to motivate them. Could be money, could be something else entirely. This post was so great to read through, and there are a lot of essential points raised. Regarding the points contributors are excelling at, I wholeheartedly agree those are right. I think it’s important to reflect and note what across the teams is done well and then look at what we can either learn from other teams or iterate as a whole. I mention learning from other groups as I think it is essential not to overlook. I’ve been reflecting on the coming year myself, and the word ‘bridge’ comes up a lot. This ties into your points about collaboration. Most teams are connective ones that fail when working in isolation, for example, the design team should be one that has connections across a wide range of groups. These bridges are mighty and starting to happen across the project. There is one forming across accessibility and design, and I see a lot of others building across the project. Teams need not be walled but free-flowing spaces that enable collaboration. Some of this comes I think in uniting our practices and distilling the best from each group into standard processes. It makes it easier for people to traverse different teams then. Another part of this is cultural. I don’t think anything is missing from this list, or at least this is a starting point. Support wise; I would love to see more teams openly sharing what works for them as processes and coordination. Doing this helps others learn and as a united group we can distil common practices. I think that “Tracking conversations and progress across the project” is the most important. I am very aware if you are in a different timezone or limited on your hours to contribute, the constant stream of fragmented communication is just impossible to follow. Fixing that will make it easier to participate, less stressful also for everyone. As a start, can we please stop using the term ‘P2’? I’ve been addressing this at several levels. It took me a year to find out what it meant. It felt like a very incrowdy term and it made me feel stupid not knowing what was meant by it. Make it more general to include people that have not been around since whenever. I can give my point of view as Community Team Rep: agree 100% both on the strength and the challenges. I don’t think anything is missing from the list. I am spending most of my time in the Community Team doing admin work: HelpScout, vetting, orienting and team chats. I miss a space for bigger, broader discussions and I miss a way to track our progress. At WCUS a group of new contributors created a procedure for us in Trello but we don’t use it. I wonder if we need to make it a requirement. I see that the Marketing Team has everything in Trello and their meetings are dedicated in part to check the progress of their mid to long-term projects. The Community Team uses the blog as a place for discussion, but many of our discussions lack a resolution, even a negative one. I think this is a combination of lack of tools but also in part a not very clear structure of the team itself. I wrote about this in the past: who has the last word? I started working on a Decision Making Process discovery in 2017, but it went nowhere because of lack of time but also of clear goals. Just catching up after being away for a few months, and I’m extremely happy to see this assessment and summary of strengths and challenges. Improving transparency and focus will go a long way toward retaining contributors who begin with enthusiasm but drop off disillusioned or confused. I look forward to hearing next steps.